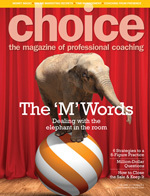 Create Your Coaching Plan - Coaching and Leadership International Inc. In order to maximize your valuable time and be in a state of readiness for your PCMK - Power Coaching� sessions, it is a good idea to Create Your Power Coaching� Plan. The results you expect from your work with your Power Coach. a. Your challenges at this moment in any or all areas of your life. b. The things you are grateful for in your life. Print a copy of this list which will take you less than 5 minutes to do. It is designed to be a quick stimulator of thought with respect the challenges and goals you may wish to work on in your job and/or in your private life. Present this insight to your Power Coach. The following link will take you to the Self-Coaching Section of this website. Agree to the on-line License and then click on "Most Common Coaching Issues". This quick 10 minute profile gives you additional insight into the challenges and goals you may wish to add to your Coaching Plan. If you choose other methods, do these two last. Taking approximately one hour to complete The Happiness in 7 Areas of Your Life profile is a thorough one. It gives a vast amount of insight into the challenges and goals in all areas of your life and also provides an opportunity for you to celebrate your strengths. The on-line system then guides you to complete The Summary Accelerator Intake Form which takes all of this knowledge and invites you to create a thorough Coaching Plan. The following link will take you to the Self-Coaching Section of this website. Agree to the on-line License and then click on "Happiness in 7 Areas of Life". Upon completion, the system will guide you to automatically send a copy of the results to your Power Coach� and/or make a copy for yourself. The first three profiles listed below are available by clicking on The CLI Store. Contact CLI for d. profiles. a. The DiSC? Classic provides a comprehensive measurement of your behaviour in the workplace and at home. Use it to measure the progress from your PCMK sessions. b. The Time Mastery Profile provides tips on how to better manage your time. c. The DiSC Relationship Profile assist two people in improving their relationship. d. CLI Business Management Competencies and Values-Based Competencies are also available through CLI. e. Other Profiles such as your Performance Agreement at work.